The Hopkins Bros. Grocery at 117 W. Main (now Big Spring Spa; in 1940’s it was Cy’s Alabam Café) was built in 1900 by Archibald Hopkins. “Archibald Hopkins, a Welsh immigrant, settled in the Cottonwood area on his arrival in Central Montana around 1875 and raised produce which was freighted to surrounding communities. 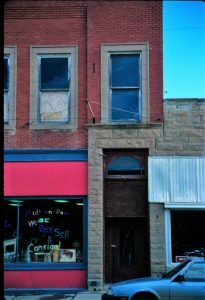 By 1899, Lewistown had become the county seat of Fergus County and promised to be the commercial metropolis, so Mr. Hopkins purchased half of a lot on Lewistown’s Main Street and the Hopkins Brother’s grocery was built. 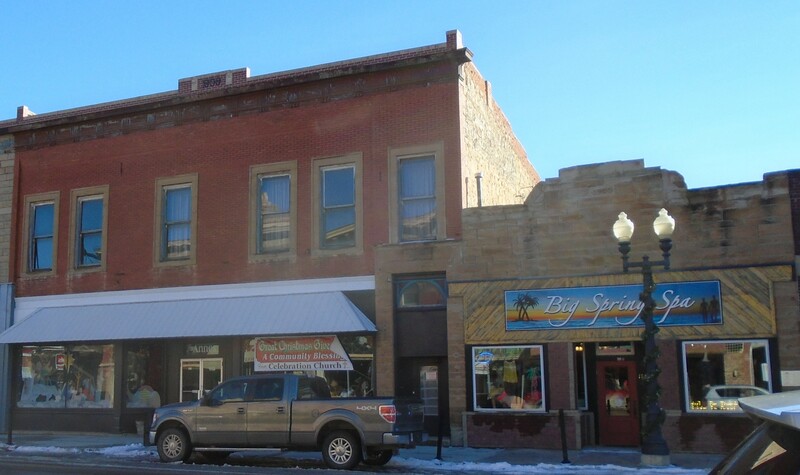 The 1900 stone building is typical of the early permanent architecture which was soon to line the streets of Lewistown.” (Sievert, Montana Historical and Architectural Inventory, 1984.). “A. Hopkins & Son, W. H., are building a stone store building on the east side, adjoining the furniture establishment of W. S. Smith. The new building will be 25 x 60 and possibly two stories in height, though this has not been definitely decided. In connection with the store a commodious cold storage warehouse has been erected on the Hopkins property in the south end of town.” (Fergus County Argus, September 13, 1899). “A. Hopkins and Sons opened their new store on the east side Saturday evening and are now in the field for a share of the grocery business of Lewistown and vicinity. They will carry a complete line of staple and fancy groceries and farm produce and endeavor to merit a large patronage. W. H. Hopkins, not new to the grocery business in Lewistown as he was formally a partner of Joseph Bertrand, is the manager of the new store….The store was built for their use and is light and commodious.” (Fergus County Argus, May 2, 1900). On the right is the first Hopkins Block built in 1900 and on the left is the 2nd Hopkins building built in 1909. 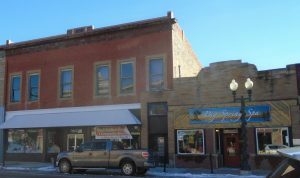 Hopkins Bros Building at 113-115 W. Main (earlier it was Jacobs Store) was built in 1909 by Andrew Green. They built it next to their old grocery store to enlarge their business. 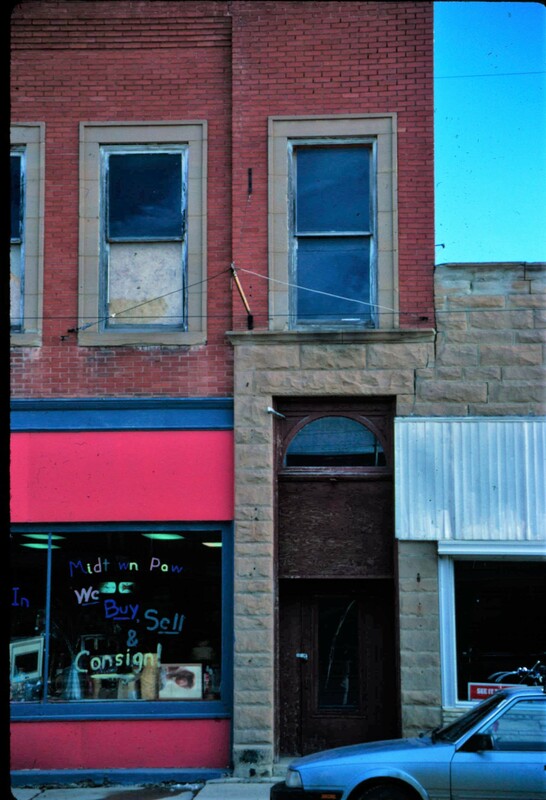 On the second floor was the Modern Rooming House with Mack O. Chester as Manager. “Frank M. Marble ….. has decided to locate in Lewistown and will become interested in the firm of Hopkins brothers. The new firm which shall include Will and Roy Hopkins and Frank Marble will shortly be incorporated and the new member will have a responsible position in the management. They will occupy their magnificent new building, now about completed, just below their old store and will inaugurate many improvements of modern-day merchandising.” (Fergus County Democrat October 5, 1909). “Hopkins brothers last week put in an order of about $2000 worth of fine new fixtures for their new grocery store which is now bearing completion on lower Main Street….” (Fergus County Democrat October 12, 1909). “The new Hopkins Brothers Company cash grocers are now in their new building just below their old stand on Main Street and are better than ever prepared to cater to their growing trade. The new building which is constructed of brick, expressly for their store, is two stories high and contains a full basement. The grocery store occupies the first and basement floors or two rooms each 50 x 90’ in size. In addition they have a big stone warehouse 60 x 60’ in size and with three floors. The new store building is heated by steam and has been fitted up with all the latest equipment in shelving, bins, showcases etc.” (Fergus County Democrat, November 30, 1909). This photo shows the interesting integration of the two buildings.